Love it or loathe it, automated pitch-correction is here to stay. Antares’ Auto-Tune first made it possible, and has become so well-known that its name is often used generically to describe all such tools, but there are plenty of other software-based pitch-correction tools out there. However, most are primarily intended for studio use, where they will be applied as post-recording processes. For live performance there have, of course, been a number of dedicated hardware devices that offer pitch-correction in real time, including the now-discontinued Antares ATR-1 and various TC-Helicon products. It’s easy enough to see two sides to the desirability of such a tool in a live setting and I’ll leave you to have that discussion amongst yourselves but, in a world where the computer sits centre stage in so many music-making environments, the user control and flexibility offered by software-only solutions could have obvious benefits in a live context too. Well, Antares obviously think so, because they have a version of Auto-Tune called Auto-Tune Live targeted at precisely this role, and Waves have now joined the roll-call with their own take on the genre: Tune Real-Time. Providing the rest of your system doesn’t create a processing bottleneck somewhere along the line, Tune Real-Time is designed to operate with sufficiently low latency to be fast enough for even the most demanding live-performance situation. 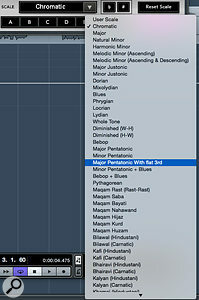 And, as I’ll get to in a minute, the plug-in can also be used as a standard post-recording pitch-correction tool. Waves are not new to the business of pitch-correction. Indeed, SOS reviewed the original Waves Tune way back in the November 2006 issue. While Tune can carry out pitch-correction automatically as well as manually, like the Melodyne plug-in it requires your audio to be ‘tracked’ into the plug-in before this can take place. However, faster computer systems mean that, 10 years on, real-time pitch-correction with a plug-in is now a viable prospect. Once installed via the slick Waves Central licence management system, how you configure Tune Real-Time will depend upon your type of use. For routine automatic pitch-correction of previously tracked vocals, you would, of course, simply insert the plug-in on your vocal track and get cracking with tweaking the control set to suit. However, if you are interested in live pitch-correction — whether that’s during tracking in the studio or for live performances — a different arrangement is going to be required. While the specifics will undoubtedly depend upon your exact hardware/software configuration, Tune Real-Time is going to need to be inserted in your signal flow in a way that allows the engineer (studio or front-of-house) and the singer to monitor through it in real time. As when applying any software processing to a live audio signal, that means a return journey for the audio through your computer system and back out to your monitor setup, making low latency all round an obvious requirement. The control set allows you to select a voice type to focus the pitch-correction within a certain note range. 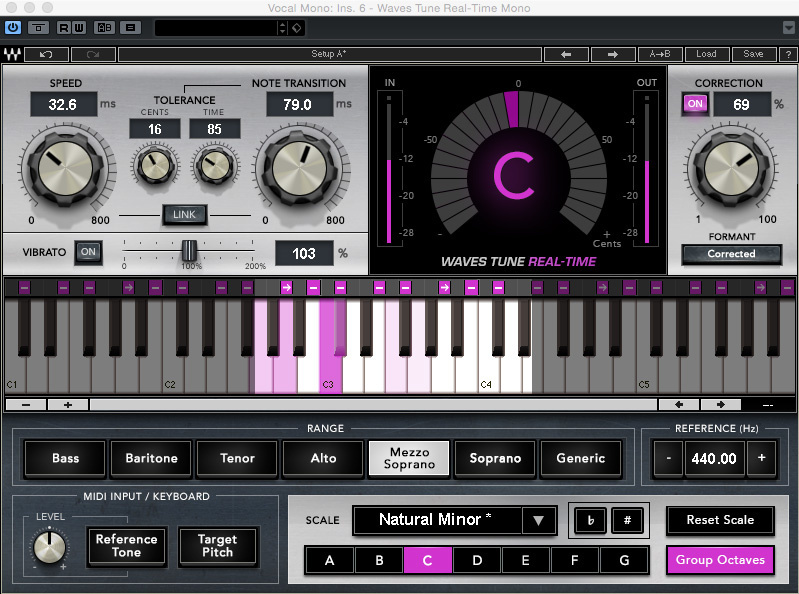 You can define your own scale using the keyboard display, and the plug-in includes a huge number of preset scale types.The user interface shares many common elements with that of the studio-orientated Waves Tune and, indeed, other pitch-correction tools. For example, the bottom third of the panel provides scale/key selection and a choice of voice types — which, in turn, set a default note range within which pitch-correction will be applied. The small MIDI Input/Keyboard panel allows you to give your singer a reference tone or use an external MIDI keyboard to set target notes. Other parameters in the control set can also be controlled via MIDI, including the Speed parameter, so you can, for instance, apply ‘robotic’ pitch-correction just to a few notes as a special effect. 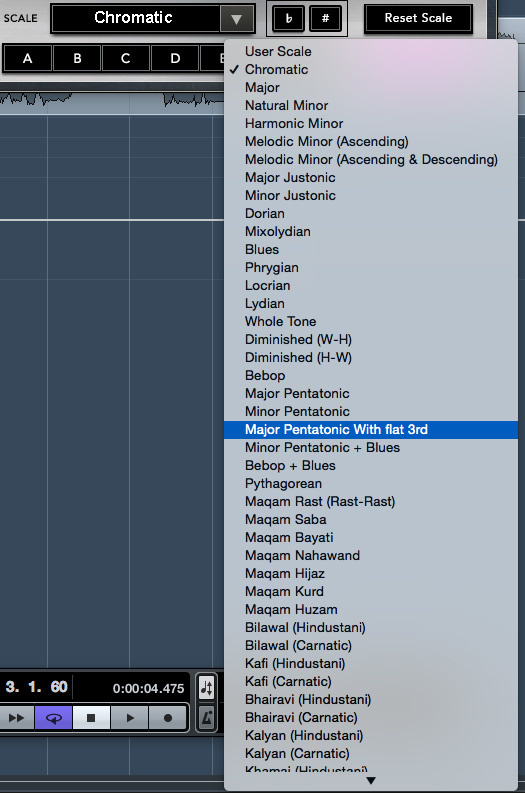 The central keyboard strip provides a visual guide to the notes being detected as the plug-in does its thing. As well as letting you drag the left/right boundaries of the active note range, this includes an interesting additional feature whereby clicking above each note allows you to toggle its behaviour in the pitch-correction process. This includes modes for ‘legal’ (grey), ‘illegal’ (pink with a ‘-‘ icon) or ‘bypass’ (grey with an ‘x’; the note is legal but no pitch-correction is applied); but there are also two other ‘illegal’ options, both with pink arrow icons that can point to notes above or below the current note. If the pitch-detection algorithm identifies such a note, it will force the correction in the direction indicated by the arrow. This is a useful feature, as it allows you to handle the correction of specific notes in a very particular fashion. The keyboard section allows you to define how the pitch-correction behaves for individual notes. For example, a singer might end up consistently flat with notes at the top of their range or sharp towards the bottom of it. Tune Real-Time can accommodate that and I could imagine that in a live setting, where an FOH engineer gets to know a specific singer’s strengths and weaknesses night after night, this could offer very precise control. You can set these five different correction states either on individual notes or, with the Group Octaves button engaged, for every octave. The topmost panel contains both familiar and less familiar elements. Familiar is the large arc-shaped pitch-correction display that shows the amount of correction being applied in real time. Also familiar is the Speed dial, which controls just how quickly pitch-correction is applied at the onset of a note. Values in the 40-60 ms range produce fairly aggressive correction, while slower speeds provide a more transparent result. And, yes, by setting it to zero you can get the ‘Cher effect’. The Correction subpanel allows you to adjust just how tightly the pitch-correction is applied. Backing off from 100 percent here does help in terms of keeping the result transparent. If you want something more in the special effects category, you can also turn formant correction off; in conjunction with MIDI control of the notes, you can then move towards Micky Mouse or Darth Vader if you so wish. The Note Transition controls provide interesting additional options for handling the pitch-correction process across note boundaries. Perhaps more interesting are the Note Transition and Tolerance controls. While the Speed control deals with the first note of a legato phrase, in the Wave Tune algorithm (in both its real-time and non-real-time formats), the Note Transition control influences the speed of correction applied as one note transitions into another during a phrase. In addition, the Cents and Time controls provide further influence over note transitions, allowing you to tolerate wider pitch drift before correction kicks in. OK, so the pitch-correction is still automatic, but these additional options do seem to offer an extra level of control. Rather neatly, you can also dampen or exaggerate any natural vibrato present in the vocal (although you can’t add artificial vibrato). This is actually well worth experimenting with as its on/off status, and the slider value, interacts with the pitch-correction process; if you find yourself with the occasional unwanted ‘pitch flutter’ on a sustained note, tweaking these settings can sometimes tame it. If Waves Tune Real-Time is to be considered a success, it must be able to satisfy on two obvious points. First, is the processing actually fast enough for real-time use? Second, is the quality, flexibility and stability of the automatic pitch-correction processing up to the job? While my own testing was studio-based, in terms of the first question, I think the answer is a very clear yes. OK, in a recording session, I’m not sure I’d generally want to track with pitch-correction in my signal chain but, if it is something you need — perhaps as a special effect or to provide a bit of a comfort blanket to an insecure singer — Tune Real-Time can do it. The trick, both in the studio and in a live performance context, is to ensure that the rest of your monitoring signal chain doesn’t scupper the plug-in’s efficient, low-latency operation. In a mission-critical live context, that might mean putting Tune Real-Time’s needs at the top of your performance priority list. In terms of the second question, as an automatic pitch-correction tool, Tune Real-Time is most certainly competitive with the other leading contenders. I tested it alongside Antares Auto-Tune Live; both were capable of meeting the need for speed required for real-time use and, with the obvious qualification that I’ll get to next, both delivered very good results. What’s more, the Waves control set — and in particular the note transition features and ability to configure the direction of pitch-correction on individual notes — makes for a lot of flexibility. Yes, you are still in the hands of an automated correction process, but these controls give you useful ways to influence the operation of that process. And that obvious qualification? Automatic pitch-correction will not turn a Friday night karaoke singer into a Christina Aguilera or a Michael Bublé; this technology is impressive, and in many ways remarkable, but is not a substitute for actual vocal skills. If you set Tune Real-Time to fast pitch-quantise, even a pub singer might get away with a few bars of ‘special Cher effect’ but, if it’s a more natural performance you are seeking, Tune Real-Time will not rescue someone who really can’t sing. That is, of course, a very good thing and, in one sense, it means the whole argument about pitch-correction in a live-performance context is still a bit moot. If your singer has his or her skills down, yes, software like Waves Tune Real-Time can support and enhance their performance, and perhaps help compensate for situations where poor monitoring or tiredness can make even a good singer’s pitch a little off. In the studio, it is perhaps possible to do more to overcome a singer’s limitations, but this would really require the offline processing options provided by the likes of Melodyne or the full version of Auto-Tune. However, it is worth emphasising that Tune Real-Time is also a great option in the studio providing all you need is automatic pitch-correction. Don’t expect miracles of this or any automatic pitch-correction tool, but if you are starting with a solid singer, Waves Tune Real-Time is more than capable of tidying up any loose edges that might occur. From a software perspective, the obvious competition is Antares’ Auto-Tune Live, currently costing about the same as Tune Real-Time at its full price. There are also hardware alternatives, and in particular, TC-Helicon have developed a number of products aimed at live performance that include some pitch-correction options. A current example is the Mic Mechanic footpedal: this includes chromatic pitch-correction and is competitively priced, but does not provide the flexibility or level of user control offered by Tune Real-Time. Latency of the plug-in is low enough for live use, providing the rest of the system configuration is up to the task. For an automated process, it offers plenty of user control. The quality of the automated pitch-correction processing is certainly a match for the obvious competition. Requires a low-latency computer/audio system for ‘live’ real-time use. If you don’t need the option of manual pitch editing, Waves Tune Real-Time is a very capable automatic pitch-correction tool for studio use and, given the low latency of the plug-in itself, a viable option for use in a live performance context — providing you are dealing with a competent singer in the first place. Waves Tune Real-Time v9.6.14.12 Build 87243. Apple iMac with 3.5GHz Intel Core i7 CPU and 32GB RAM, running Mac OS 10.10.5, with Soundcraft Signature 12MTK mixer/interface. Tested with Steinberg Cubase Pro 8.5.